What’s It About? A washed-up former superhero actor battles with his cast, his family and his own ego to put on a Broadway show in an attempt to regain his relevance – all whilst being haunted by his former alter ego. Verdict: This reasonably straightforward plot, in lesser hands, could have produced a generic, predictable drama. 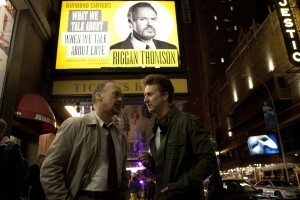 But in the hands of Alejandro González Iñárritu, and with Michael Keaton, Edward Norton, Emma Stone and others at the very top of their game, Birdman, or The Unexpected Virtue Of Ignorance, is elevated into one of the most surprising, creative and brilliant films in a long time. Iñárritu is perhaps best known for larger-scale films like Babel and Amores Perros; he’s used to non-linear time structures and connecting seemingly separate storylines. Here he shows he can put every bit as much creativity and flair into a linear film, but the result is every bit as confident, bold and exciting. The film begins with Keaton’s Riggan Thomson backstage in his dressing room, and we hear the voice in his head, the voice that haunts him but provides so much of the humour of the film (and the voice also heard throughout the trailer). Writing, directing and starring in a play has clearly pushed Riggan to the edge – but it’s hard to know what to make of this scene (and the film itself) to begin with. It’s so surreal, and accompanied by a loud, thumping drum solo that actually makes dialogue quite hard to hear at times. Whilst jarring at first, the beat draws the audience in, getting more frantic as the characters do, and fitting with the film perfectly. It’s hard to think of any film that just throws you into the deep end in such a way. We’re right there with Riggan in the theatre, and spend much of the film’s 119-minute runtime there. This makes the whole film feel claustrophobic, and makes the audience feel more than just a fly on a wall, it really makes you feel invested in the storyline and their putting on the play. We’re so close to the actors that we feel a part of them. When they’re laughing, we’re laughing. When they’re arguing, we’re tense and right there in the middle of it. Using long, looming unbroken takes (à la Hitchcock’s Rope) is more than a gimmick, it makes it feel like you’re watching the events in real-time and not missing a thing. Often a character leaves the room or goes out of shot only for the camera to pan around or wait for a moment to see another character emerge from a different door. It’s actually gobsmacking how we can zoom from the street into a theatre window and continue zooming all the way down a corridor and into another room. The casting of Keaton, a former Batman, is absolutely perfect, and it’s hard to imagine a fit between an actor and a role quite so perfect (despite Keaton claiming in interviews he couldn’t relate to Riggan). In a career which includes a couple of iconic roles, Keaton gives his best performance so far. He shows tremendous range in this self-depreciating role, really throwing himself into it. He’s garnering a lot of praise for this role (and rightly so), but Ed Norton is a revelation and actually threatens to steal the show, as last-minute replacement Michael Shiner, at times. He is vain arrogance personified, horrible backstage but incredible on it, he’s a joy to watch. As well as a brilliantly-acted, beautifully shot and clever film, it satirizes the Hollywood landscape we have today, where every actor is in or linked to a superhero movie (including, of course, Keaton, Norton and Stone). There’s a great conversation at the beginning of the film where Riggan and his manager/friend Jake (a subdued and exasperated Zach Galifianakis) are trying to find a new lead for their play who hasn’t been in a superhero movie – ‘Get me that Hurt Locker guy, Jeremy Renner’, Riggan suggests, ‘Erm, he’s an Avenger now’. All of the cast put in excellent performances, each getting their own little moments, but it’s Riggan’s story, so it’s their interactions with him that really shine. It’s rare to find a film where everything just works, but that’s what we have here, in a film that should have something for everybody. Final Words: It’s hard to focus on the individual parts of a film where everything comes together and delivers in such remarkable fashion. Few films feel like such an unpredictable unknown, capable of juggling so many elements yet feeling simple at the same time. From fantasy sequences to hilarious or heartfelt moments, they are equally well-handled from the brilliant director and cast. This film is a breath of fresh air, and really hard to pigeon-hole. A true masterpiece from Iñárritu, one of the very best films of the past year and a strong contender at the upcoming Oscars. Birdman (15) is released across the UK on 1st January 2015.